Ginny writes that she is discontinuing her search, because of the price this lamb sells for. But we still have a mailing list of people looking for this lamb. I’m looking for a white “Easter” puffalump lamb 1987. My 21 year old daughter sleeps with the remains of her “puffy” every night, and I wanted to replace it for her. It has become so shredded that we had to put it in pajamas from an old doll to keep the stuffing inside. She also sleeps with a chicken puffalump that was from that same era, and it has held up much better. Every time the lamb gets washed inside a nylon bag, it has to be re-stuffed. Maybe that is why they are so rare, they didn’t hold up as well as other Puffalumps. We have lost it 2 times. Once at a pizza place while traveling through Blythe, Arizona. They mailed it to us in a pizza box and another time it got scooped up in the hotel linens, but was salvaged the following day through notes written in Spanish to the hotel crew. Needless to say, it is like another member of our family. I often tell her, when she gets married, she might have to leave it behind. She disagrees Ha! 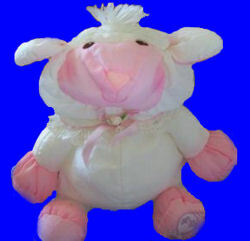 If you can help Ginny find this Puffalump White Lamb, THIS SITE IS NO LONGER ACTIVELY MANAGED. Please use Our FREE FACEBOOK GROUP, including #040308-6 in the subject, . There is the pink lamb and the yellow chick. I emailed them. Thanks, Katty!!! If anyone is still searching.